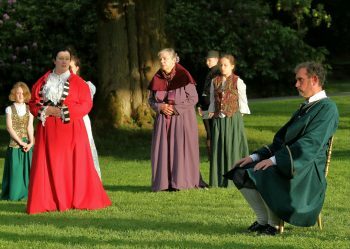 Shakespeare at Traquair is a vibrant community-based drama group, which has put on 23 annual open air promenade productions in the stunning grounds of Traquair House (Scottish Borders) since 1995. Like Shakespeare’s own company, our actors, costumiers, make-up artists, stage management and production team have other professions, but their passion and commitment to performing Shakespeare’s words never fails to entertain large cohorts of followers. In 2016, our Traquair production was The Taming of the Shrew and our younger members performed versions of Hamlet and Romeo and Juliet at the Edinburgh Fringe. In 2017, we performed The Winter’s Tale. 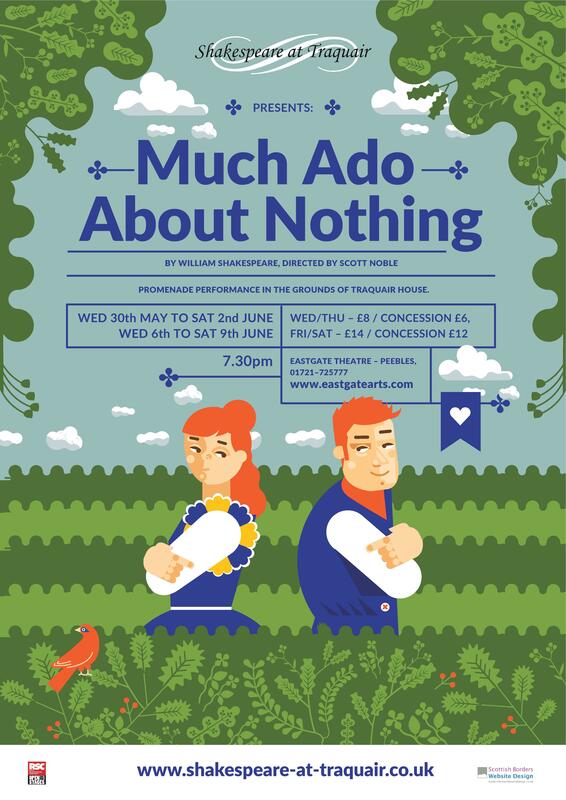 In 2018, our promenade production was Much Ado About Nothing and our youngsters performed The Taming of the Shrew and Much Ado About Nothing at the 2018 Edinburgh Fringe. 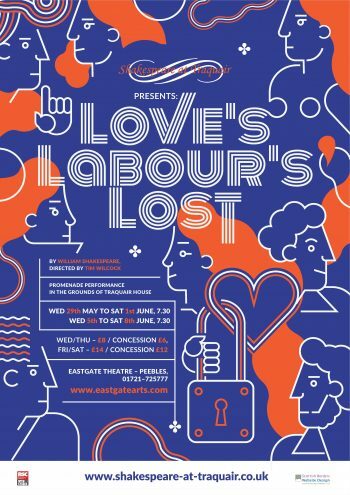 In 2019, we will be performing Love’s Labour’s Lost at Traquair House. Love’s Labour’s Lost is Shakespeare at Traquair’s main stage production for 2019 and will be directed by Tim Wilcock. The play sees self-denial in fashion at the court of Navarre where the young king and three of his courtiers forswear all pleasures in favour of serious study. But when the dazzling Princess of France and her entourage arrive, inconvenient promises are quickly ditched in favour of some ham-fisted wooing. 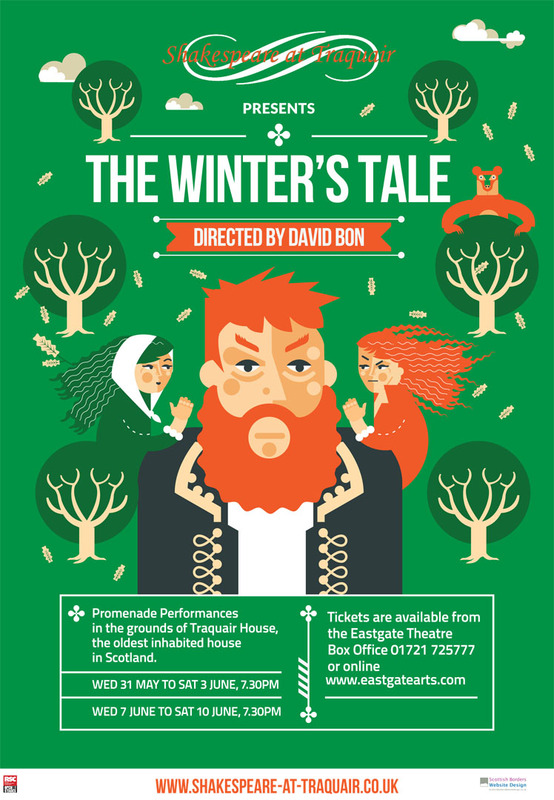 Following sell-outs in 2015 and 2016, Shakespeare at Traquair were back up to Edinburgh for Fringe 2018. 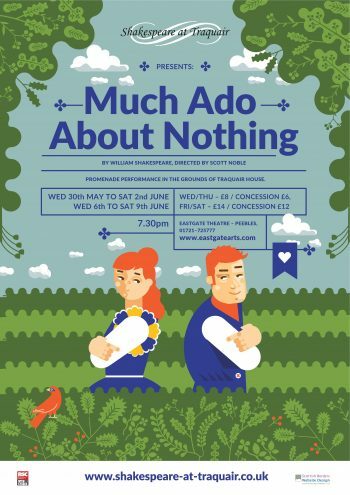 Mix fourteen young actors, a couple of Shakespeare plays, some creative editing and you’ve all the ingredients for two shows that will appeal to anyone from age 5 upwards. Out talented young cast performed rewritten and shortened versions of The Taming of the Shrew and Much Ado About Nothing, written by director Tim Wilcock. 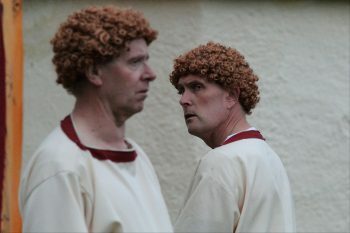 Both plays were initially performed back to back at the Eastgate Theatre (Friday 15th June) and Carlops Village Hall (Saturday 16th June).The Fringe shows were performed at theSpaceUK Niddry Street (Venue 9), with he Taming of the Shrew on the 3rd, 6th, 8th and 10th August and Much Ado About Nothing on4th, 7th, 9th and 11th August. 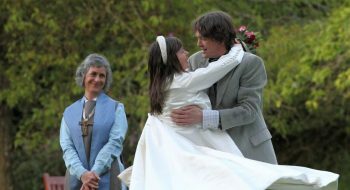 Much Ado About Nothing is a light-hearted romp set in Italy, telling the story of Benedict and Beatrice, Claudio and Hero and a raft of other characters. 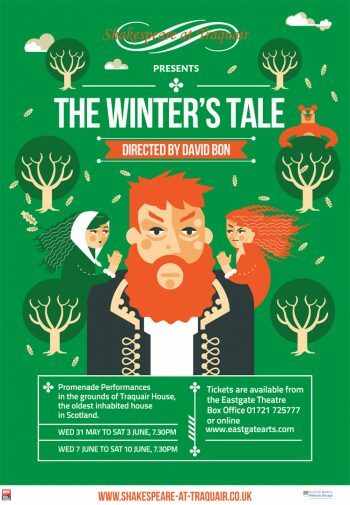 It was last performed by Shakespeare at Traquair 15 years ago, so we were delighted to be doing it again. Scott Noble, one of the original cast from 2003, directed the play. 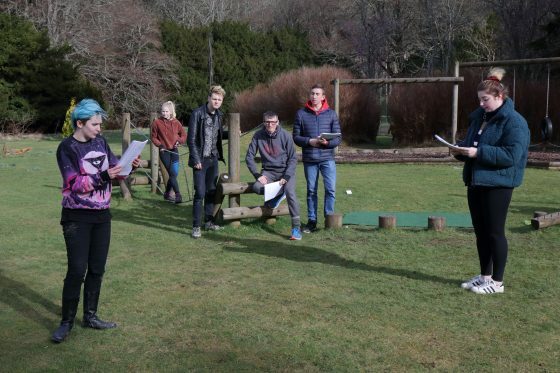 Pre-performance meals were available from the Garden Café, which is found in the beautiful Walled Garden at Traquair House. For further details about this excellent café please phone (01896 830323) or visit the café’s website. More details, including photographs, about Much Ado About Nothing are available here. You can sign up to our email list below. If you would like to do this, please enter your name and email address. Your phone number is optional. 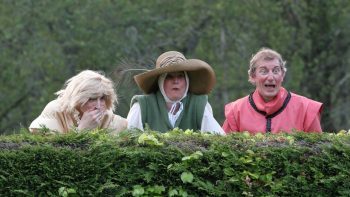 We will only contact you about Shakespeare at Traquair or related events and we will never pass your details onto anyone else. You can unsubscribe at any time by clicking on the unsubscribe link in any emails you have been sent. If you have any questions please email us. 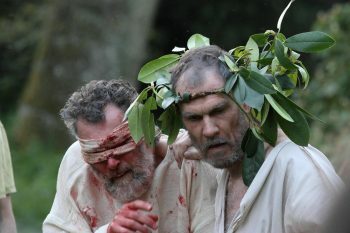 In 2017 we performed The Winter’s Tale, which was directed by David Bon, who has acted with the group since 2007 and previously directed The Comedy of Errors in 2014. 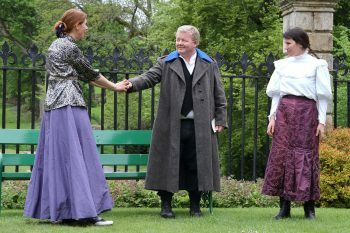 The play took place in the grounds of Traquair House between 31st May – 3rd June and 7th -10th June. Carol Norris (Paulina), Leah Moorhouse (Hermione) and Scott Noble (Leontes) discussing the Paulina, one of Shakespeare’s more emancipated female characters. Following on from the fantastic range of musical and performing talent on display at the Winter’s Tale cast party Boyd Wild organised an open stage event at the Eastgate Theatre on Sunday 5th November. This,which was open to all past and present members of Shakespeare at Traquair, but with particular emphasis on our younger contingent. This was a great success, with a couple of hours of entertainment and photographs can be seen here. We are a friendly, inclusive group and welcome people of all ages who would like to act or help behind the scenes. Our main summer productions involved adults and children, but we also have children only shows. Find out more about us and how you can become involved. We have a large archive of past productions, at Traquair House and others at the Eastgate Theatre and elsewhere.